For origami enthusiasts, Halloween fun starts way before October 31st, when we start folding decorations. I used Canson Expressions paper for the leaves, and color copy paper for the petals. 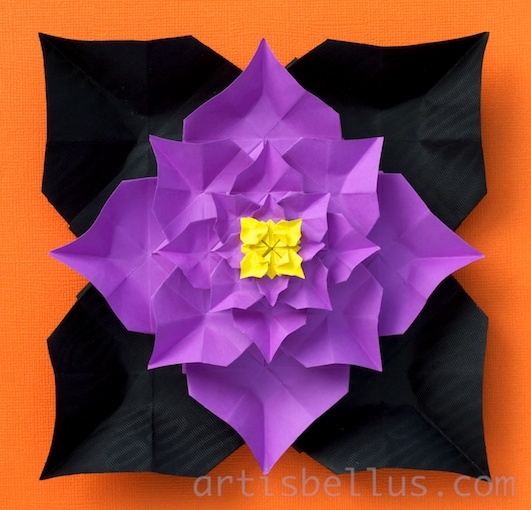 The Halloween flower is a variation of my model "Poinsettia". If you like to give it a try, you can fold the Halloween flower by following the Poinsettia diagram. One "leaves module," black, 12" (300 mm) square. 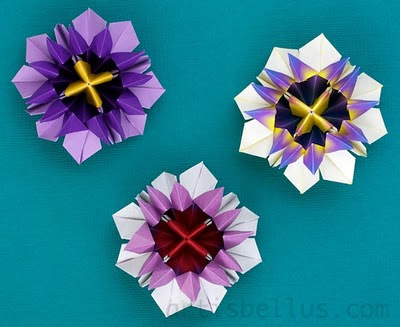 Five "big petals modules," purple, with squares of the following sizes: 8"(200 mm), 6"(150 mm), 4"(100 mm), 3"(75 mm) and, 2"(50 mm). One "small petals module," yellow, 1 ½" (38mm) square. 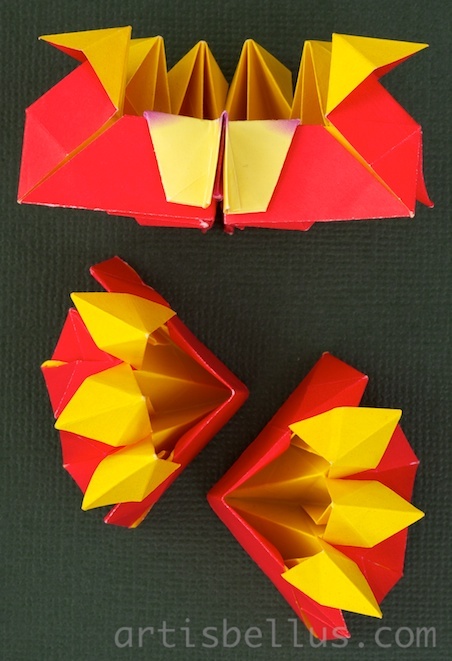 The modules are assembled in the same way as in the Poinsettia. Have you started folding Halloween decorations too? The passion flower model is my design. I folded the flowers in the picture with duo and patterned kami paper: 3" (75 mm) squares for the petal modules, and 2" (50 mm) squares for the stamen modules. The passion flower petals consist of four "3 Pajaritas"modules that are joined with a stamens module. 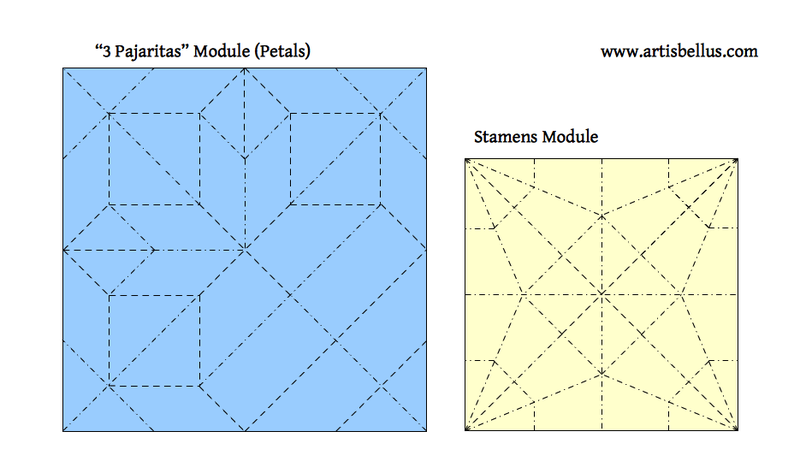 I called the petals module "3 Pajaritas," because it's just that. It's obtained by dividing the paper in quarters and then folding a traditional spanish pajarita in three of them. The stamens module is a bird base upside down, where each petal is folded inside in half, and then folded down. The pictures below show the crease patterns and a detail of the modules. 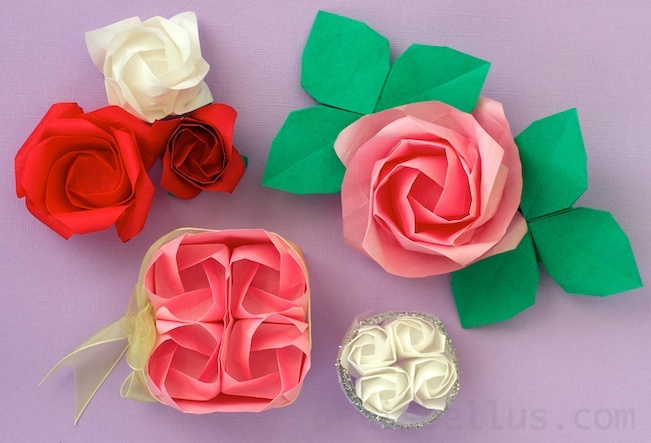 Decorating with origami is so much fun! There are so many options! 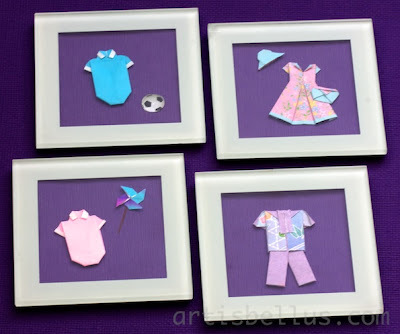 On this occasion, I used a set of photo coasters , and instead of photos, I decorated them with small origami models. This can be a great gift for the upcoming Holidays, and you can personalize each coaster for every member of the family. Each coaster measures 3 ½" x 3 ½" (88 mm x 88 mm), and the display measures 2 ½"x 2 ½" (63 mm x 63 mm). The final size of the origami models used for decoration are very small, so try to choose simple models. The models must also fold flat. Shirt, by Marcela Brina, from 4 ½" x 1 ½" (113 mm x 38 mm) duo kami paper. This is a variation of the traditional kimono model. The video instructions can be found here. Pants, by Rachel Katz, from 3" x 1 ½" (75 mm x 38 mm) kami paper. 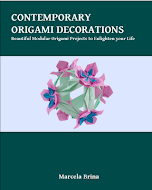 The diagram can be found in the book Origami, Easy-to-Make Paper Creations by Gay Merrill Gross. Two tone dress, by Gay Merrill Gross, from 2" x 2" (50 mm x 50 mm) duo kami paper. 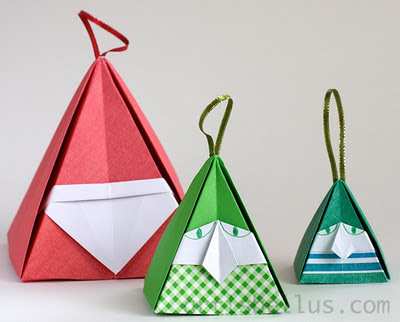 The diagram can be found in the book Minigami , by Gay Merrill Gross. Hat, by Gay Merrill Gross, from ¾" x ¾" (19 mm x 19 mm) duo kami paper. The diagram can be found in the book Minigami , by Gay Merrill Gross. Handbag, traditional, from 1" x 1" (25 mm x 25 mm) duo kami paper. The diagram can be found in the book Minigami , by Gay Merrill Gross. Baby bodysuit, traditional, from 1 ½" x 3" (38 mm x 75 mm) kami paper. This is the traditional shirt model with two extra folds (the two bottom corners were folded back). The diagram can be found in the book The Practical Illustrated Encyclopedia of Origami , by Rick Beech. Ball, not an origami model. It's a sticker. Baby bodysuit, same as in baby boy's coaster. Pinwheel, traditional, from ½" x ½" (13 mm x 13 mm) kami paper. The diagram can be found in the book The Magic of Origami , by Alice Gray and Kunihiko Kasahara.